Maritime boundary delimitations, both negotiated by governments or decided by a court or arbitral panel, have increased in the last 20 years. This book provides commentary on judgments and awards since 1969, as a guide for practitioners and government legal advisers. It includes ... read full description below. 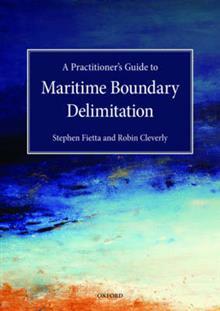 This book provides a user-friendly and practical guide to the modern law of maritime boundary delimitation. The law of maritime boundaries has seen substantial evolution in recent decades. The book provides a comprehensive overview of the law in this field, and its development through the United Nations Convention on the Law of the Sea, which set out the framework of the modern law in 1982. The Convention itself has since been substantially built upon and clarified by a series of judicial and arbitral decisions in boundary disputes between sovereign states, which themselves also built upon earlier case law. The book dissects each of the leading international judgments and awards since the North Sea Continental Shelf Cases in 1969, providing a full analysis of the issues and context in each case, explaining their fundamental importance to shaping the law. The book provides forty clear technical illustrations prepared by the UK Hydrographic Office, the leading supplier of maps for international dispute resolution, to carefully demonstrate the key issues at stake in this complex area of law. Technological developments in the exploitation of maritime natural resources (including oil and gas) have provided a significant impetus for recent boundary disputes, as they have made the resources found in remote areas of the ocean and seabed more accessible. However, these resources cannot effectively be exploited at the moment, as hundreds of maritime boundaries worldwide remain undelimited. The book therefore complements the legal considerations raised with substantial technical input. It also identifies key issues in maritime delimitation which have yet to be resolved, and sets out the possible future direction the law may take in resolving them. It will be an unique and valuable resource for lawyers involved in cases involving maritime delimitation, and scholars and students of the law of the sea. Stephen Fietta is a the principal and founder of Fietta, an international law firm based in London. He is one of the few practising lawyers globally whose practice focuses exclusively on public international law. A substantial part of Stephen's practice concerns the Law of the Sea. He advises sovereign States, energy interests and other entities around the world on all aspects of maritime delimitation. He was Counsel and Advocate for Barbados in the first ever maritime boundary delimitation arbitration proceeding under UNCLOS (against Trinidad and Tobago, decided in 2006). He has lectured at Kings College, London since 2006 on maritime delimitation law and practice on the MA course entitled Geopolitics, Territory and Security (formerly International Boundary Studies). He graduated in law from Jesus College, Cambridge in 1993. Dr Robin Cleverly is a Law of the Sea consultant specialising in the technical aspects of law of the sea which he took up after a long career as a petroleum exploration geologist in the oil industry. He was formerly head of the law of the sea group at the UK Hydrographic Office. He provides technical advice to governments world-wide for the negotiation and delimitation of maritime boundaries, and also to oil majors and independents. He has worked extensively on maritime boundary cases at the International Court of Justice and other international arbitrations. He graduated with an MA and DPhil in geology from St Catherine's College, Oxford.